This fall, the U.S. Supreme Court will hear arguments in Elonis v. U.S., a case involving rap lyrics that were prosecuted as threats. 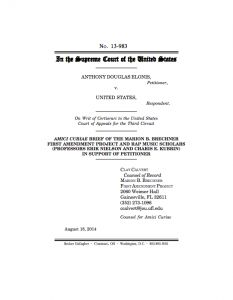 Today, the University of Florida’s Marion B. Brechner First Amendment Project submitted this amicus brief to the Court, which I wrote along with Professors Clay Calvert and Charis Kubrin. In it, we argue that the complexities of rap, not to mention the negative reactions that it evokes in many people, make it susceptible to misinterpretation. It makes sense, therefore, that a speaker’s intent is crucial in determining what constitutes a real threat. To any rap fan, this is basic common sense. In the legal system, unfortunately, common sense doesn’t always prevail. I can say that same rap today is not what it used to be back in the day. The article pointed on a very valid point- that unfamiliar things such as rap music will be perceived in a way that it was not meant. Other than the vulgar language–(in which , you use at home) you could learn some life lessons. Especially artists like Common. He sends positive messages in his rap. Not all rap is bad!! Nice work you guys!